It’s been two years since Nielsen first began developing a tool to measure viewers across all platforms—not just TV watchers as it has for the last 65 years. Since then, however, the project has attained mythical status among many advertisers, buyers and network executives. “I’ll believe it when I see it,” more than one has told me dismissively in recent months. But the wait is almost over. Nielsen is putting the finishing touches on total audience measurement and gave Adweek an exclusive look at its new multiplatform measurement tool, which it says will forever change the industry. The company will begin sharing data with its clients this December and roll out the tool’s full capabilities early next year. To paraphrase Seinfeld, total audience measurement is real and, given the industry’s growing cries this fall (in the face of more live TV viewership declines) for a tool that will finally allow them to fully measure and monetize viewers, it’s spectacular. 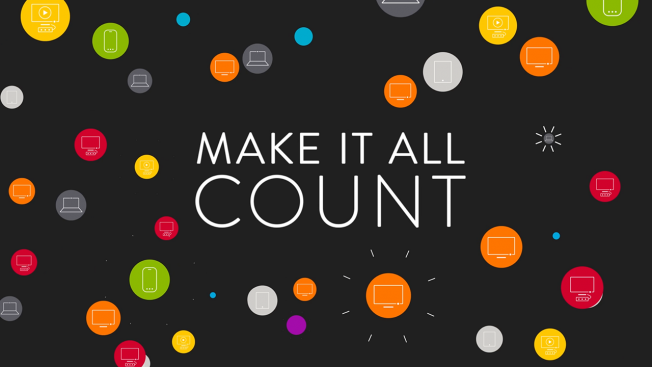 The result is total audience measurement, Nielsen’s single-sourced platform to account for all viewing across linear TV, DVR, VOD, connected TV devices (Roku, Apple TV and Xbox), mobile, PC and tablets. The only thing left out: streaming content on wearables like the Apple Watch. “There’s always going to be things that are so small for us right now,” said Clarken. “What we’re acutely aware of is our measurement underpins $70 billion worth of advertising,” she added. While TV ratings would indicate that television viewership is in continued decline, especially this fall, “video viewing is actually relatively flat, but it’s moved,” said Clarken, as audiences continue to shift from live TV to watching VOD and connected devices or streaming them via mobile or tablet devices, which are not measured in the industry’s standard C3 and C7 ratings metrics. Digital first providers like YouTube and AOL have also been shut out. They will now be included. Notably, among the adults 25-34 demographic, only 15 percent watched the episode live (compared with 64 percent of adults 50 and older). Of that same 25-34 demo, 22 percent used a connected TV to watch the show, and 18 percent watched it digitally, the highest of any demo. Meanwhile, other shows will discover that they are not as popular across all platforms. Another Nielsen client asked the company to measure its audience across digital devices only to learn that its lift is minuscule. “What this does for them is it tells them that and it allows them to reset their strategies” to reduce dynamic ad load, said Clarken. 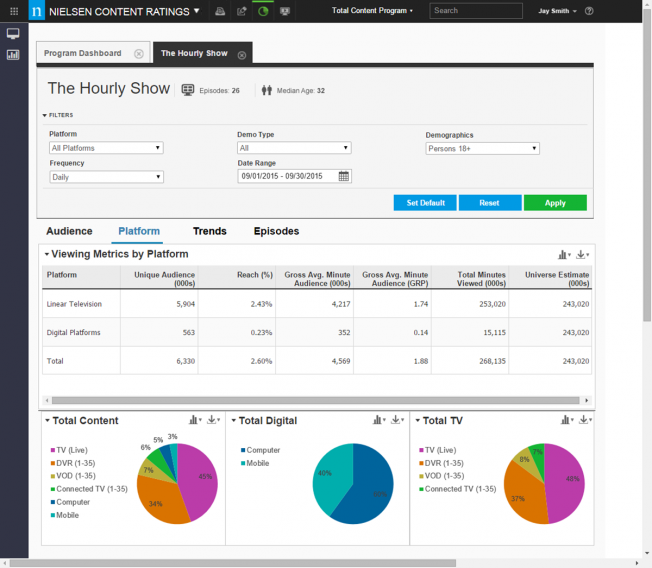 The first look at Nielsen’s total audience measurement tool, coming early next year.